Lufthansa Technik Intercoat specializes in the coating of components damaged by wear or corrosion. With the help of an advanced epoxy coating process, components that would have had to be scrapped in the past can now be refurbished and continue to be used. The material that makes this possible is called INTERFILL®. Specially developed and tested for airworthiness, this material gives aircraft components a new life cycle while also improving their operational characteristics. As a result, the repaired components are even better than the original ones. So that INTERFILL® can be used for different components in the aviation, rail and automotive industries, several versions of the material have been developed that differ in terms of their possible applications, abrasion resistance and surface qualities. Up to now, INTERFILL® was applied manually in several layers with a thickness ranging from 0.05 to 0.5 millimeters. Now Lufthansa Technik Intercoat has accomplished something that was considered impossible for a long time: It managed to automate part of the INTERFILL® coating process. The component is fastened to a rotating device in a working booth. 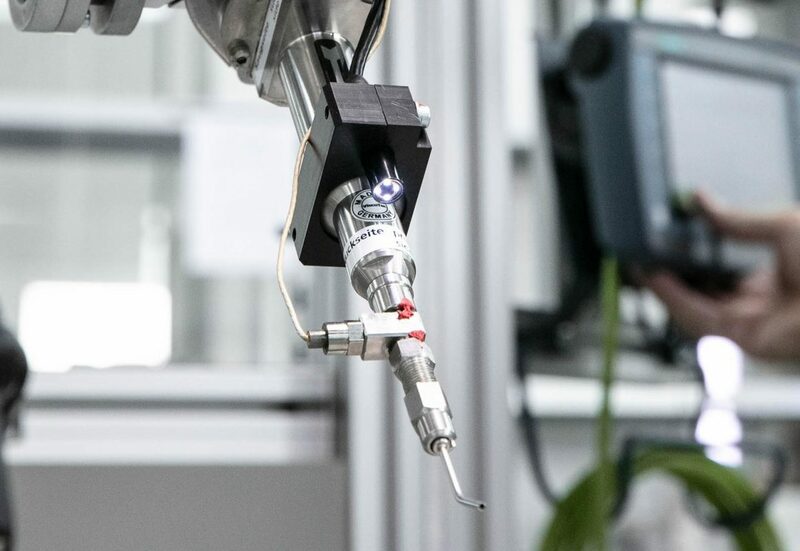 Then a robot arm applies INTERFILL® to the component surface through a fine nozzle. The entire new system was developed in-house at Lufthansa Technik Intercoat and built by an external service provider. Thanks to the partly automated process, components can be coated in a single working step. A special applicator ensures that the ideal dose is applied with an even layer thickness. The improved application method prevents air pockets from forming within the surface, which reduces the amount of corrective work that used to be necessary at times. The innovative system provides consistent, high-quality results and saves a considerable amount of time. For example, the time required to coat the component and cure the material could be reduced to a third of the normal processing time. This increases Lufthansa Technik Intercoat’s flexibility, since standardized processes mean the company is now able to process more components. The system, which has been running since September 2018, is currently able to process components of up to 500 x 500 x 500 millimeters in size and 25 kilograms in weight. Larger and heavier components are still coated manually. Extended testing has resulted in the definition of six components that can be handled by the system. 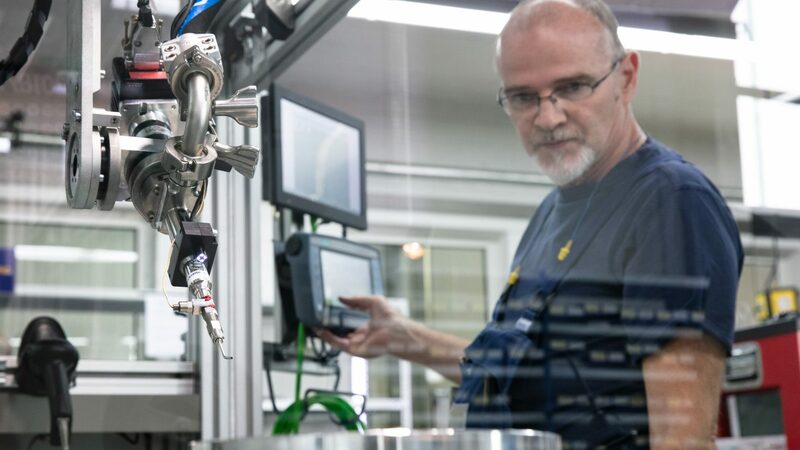 On the basis of the experience gained, Lufthansa Technik Intercoat is already planning its next step: to develop a robot system that eliminates the above restrictions by 2020. Once that system is operational, it will also be possible to coat components with more complex, non-rotation-symmetric coating areas.